Holiday apartment near Llangollen looking out over Dee Valley countryside. Hillside is a beautiful, 1-bed, self-contained apartment sleeping 2 people. Located at Llanerch Farm, an 18thC farmhouse nestled above the Dee Valley in 16 acres of private countryside; it has its own private garden, well-equipped kitchen and gorgeous views. 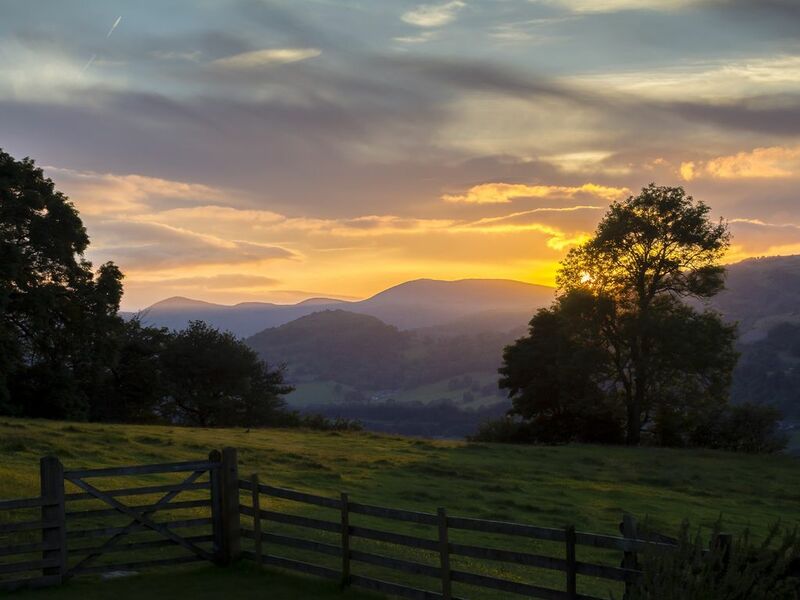 Overlooking a World Heritage site and conservation areas of special historic interest, it's the perfect place for a tranquil getaway - or to explore the gorgeous landscape of the North Wales borders and beyond. We're just over a 5min drive off the A5 up a quiet, single lane road with a couple of hairpin bends. There are plenty of passing places, and it's not as foreboding as it sounds(!) but please be aware that these sorts of roads do come with our rural location. The payoff is the magnificent view from our farm! For more info and alternative routes to us, please visit our website by typing "Llanerch Farm Llangollen" into any internet search engine. Hillside is a newly-decorated and furnished, self-contained, one-bedroom apartment situated at Llanerch Farm, an 18th century farmhouse located between Froncysyllte and Llangollen on the North Wales borderlands. Llanerch Farm is nestled in 16 acres of private land, with beautiful views of the stunning Dee Valley. We're lucky enough to be able to not only enjoy the UNESCO World Heritage site of Pontcysyllte Aqueduct from our windows, but also the 13th century Castell Dinas Bran (or "Crow Castle"), as well as a host of amazing wildlife. Hillside is a peaceful apartment which has been thoughtfully decorated and furnished to provide a flavour of contemporary Welsh farmhouse style and surroundings. It is well-equipped with everything you could need for a comfortable home-from-home, including free WiFi, kitted-out kitchen, dishwasher, washing machine, Freeview TV/DVD player/HDMI cable, board games, USB sockets and printed information on places to visit, local eateries and lots of other useful stuff. Hillside's private rear garden with patio set and parasol is the perfect spot to watch the sun set behind the romantic ruins of Dinas Bran castle, whilst our peaceful resident ponies quietly graze in the surrounding fields. The bedroom has a super-comfy king-size bed. The pretty, bijou ensuite bathroom has a walk-in shower, toilet, hand basin and heated towel rail, plus fluffy towels and complimentary accessories - we've tried to think of everything you might have forgotten! Our area also has a great 4G phone signal. Regrettably, we are unable to allow dogs to stay. Hillside is a self-contained, one bedroom apartment on the lower-ground floor of our family home, Llanerch Farm. Use of it is exclusively yours during your stay, including Hillside's own private rear garden, private entrance and parking area. Guests are welcome to take a walk from out the private rear garden into the field to enjoy the wildlife or picnic overlooking a different view of the river and valley from the bottom of our meadow. We live on site at Llanerch Farm, so one of us is usually always around and happy to help if you were to need anything. Having said that, we totally appreciate the fact that guests come to us for a quiet getaway, and have the utmost respect for their peaceful privacy. We make sure everything's in place ready for guests to check themselves in, hassle-free, but always love to meet new people and chat if you wanted advice about the local area or need help with anything. We are located on quiet lane above the A5 between the 19thC village of Froncysyllte and ancient town of Llangollen. Llangollen (a 10 minute drive away) is bustling with cafes, bars, restaurants and delis selling Welsh produce. Llangollen's world-renowned International Eisteddfod takes place every July, and the town also hosts annual comedy, music, food, walking and Christmas festivals too - to name but a few! In terms of shopping, Llangollen is super-handy for groceries and takeaways, and there is a Tesco Superstore a little over a mile away in Cefn. The border market towns of Oswestry and Wrexham are easily accessible (both just under 20mins by car), or if you fancy shopping 'til you drop, Chester and Shrewsbury are both a mere 30-40mins away by car. We are lucky to enjoy a fantastic choice of local walking routes across mountains, over moorland, along rivers and through woodland. The Panorama, Horseshoe Pass, Valle Crucis Abbey and Pistyll Rhaeadr/Ceiriog Valley walks are particularly popular. We're also situated on the A5 leading straight to the "Gateway to Snowdonia", so a great location to explore further into North Wales too. There's a superb range of adventure activities and experiences in Llangollen (including white water rafting and gorge walking), as well as caving, bungee jumping, canyoning and pony trekking in the area. As well as actually being able to see Castell Dinas Bran (a 13th century castle built on earlier ancient settlements) and the UNESCO World Heritage Site of Pontcysyllte Aqueduct from Llanerch Farm; we are also very close to 13th century Chirk Castle (seat of the Myddletons), Plas Newydd (18thC home of the celebrated Ladies of Llangollen), and Erddig Hall, which offers a unique sense of below stairs life in a Victorian country house. Other great places to explore include Betwys-y-Coed and Snowdonia, Pistyll Rhaeadr (a stunning waterfall and one of the seven Wonders of Wales), the Ceiriog Valley, Ellesmere and environs, and the lovely Welsh coastal villages of Port Meirion and Port Madog. Our local native wildlife is hugely important to us and we are passionate about continuing to work to create a haven for the wild creatures we share our land with here. You can watch some of our beautiful wildlife from Hillside itself - binoculars and bird book provided! We also have a number of lovely nature reserves on our doorstep and black grouse lekking on the moorland across the valley. Our favourite visitors to Llanerch include peregrine falcons, partridges (listen out for their arresting, mechanical calls) and spotted flycatchers. We keep regularly-updated brochures, leaflets and information outlining all of this info in Hillside for our guests to browse through during their stay. Although there are a number of good local taxi companies, as well as local busses and a decent rail network, you will need your own vehicle to reach us here at Llanerch Farm. Walking aside, it's the best way to explore the area. We're up the hill from a turning between Froncysyllte and Llangollen off the A5. It's a single lane road (with passing places) and one sharp bend. The road has been completely resurfaced and new safety barriers installed since the Street View pictures were taken. We'll send you full driving directions on booking and are usually always on hand to help. Hillside is a self-contained, one-bedroom apartment on the lower-ground floor of our family home. However, it is very private and its own entrance, parking and garden to the rear. We provide some tea, coffee and sugar, but not breakfast. We have lockable outbuildings for muddy boots or bikes, should you need it. Regrettably, Hillside is not suitable for wheelchair users. Inside the apartment there is a single shallow step between the passageway and living area and one step down from the doors into the garden. Otherwise, the space is all on one level and could be used by people with limited mobility. We are located in a peaceful spot up the hill from the A5 into Llangollen from the A483. Whilst we are handily located for access to main road routes, no traffic noise can be heard from the A5 below. Hello! I'm Lora. I'm a Writer and Business Owner. In late 2016, after 12 years of living and working in London, my husband Barry and I decided it was time to take the plunge and move back to my native North Wales. Soon after we stumbled upon Llanerch Farm, an 18th century Welsh farmhouse set in 16 acres of beautiful countryside with outstanding views of the beautiful Dee Valley, and made it our home in early May, 2017. We opened Hillside, our holiday apartment, in June 2017, so we might share this gorgeous patch of rural Wales with visitors from all over the world. We're super fortunate that we both now work from home - it sounds like a cliche but not a day goes by during which we don't appreciate how incredibly lucky we are to be here. We look forward to meeting you should you choose to stay with us here at Llanerch Farm! Hillside has one pretty, bijou ensuite bathroom with walk-in shower, toilet and wash basin. There are shelves to store your things while you stay and complimentary extras... we try to think of the things you may have forgotten! Free parking next to the entrance for up to 2 cars. Fibre optic broadband speeds of up to 18Mbps. Spacious living room with 3 seater sofa, armchair, TV, coffee table, plus a selection of games and reading material about what the local area has to offer. Cafetiere only. Just bring your favourite coffee! Our well-equipped kitchen has everything you'll need for a comfortable stay, including gas hob/electric oven dishwasher, microwave, washing machine, fridge, kettle, toaster... plus a few extras! Our cosy dining area has a dining table to eat, work (if you must!) or just enjoy the views over a morning coffee. Freeview TV plus HDMI cable to plug in your laptop or tablet. Hillside has its own private garden with seating area/patio set, leading out onto open fields, which you're welcome to take a walk in if you fancy. Help yourself to any ripe strawberries! We loved our 3 night stay at Hillside. From the moment we arrived, we knew we had found a little gem! A warm welcome message in a postcard & some delicious shortbread awaited us, plus the chilled & bottled water provided was very thoughtful. The apartment was beautiful & tastefully styled. Spotlessly clean inside with a wonderful herb & wildflower garden outside to sit in and enjoy the sunshine and watch visiting bees & butterflies. All the little extra touches from Lora were greatly appreciated - cotton wool balls/buds, toothpaste & brushes, a range of toiletries, foil/clingfilm/food bags/ washing up liquid and condiments in the kitchen, plus a fab range of DVD's & games in the lounge. Lora also provides a great selection of information/books on things to do in the local area. Lora & Barry were also very accomodating in allowing us to store our mountain bikes securely in the garage when not being used. A highlight of our stay was seeing the tenant horse & Shetland ponies through the window everyday and the amazing rainbows we saw across the valley following a shower of rain. We were able to walk easily to the Pontcysyllte Aqueduct which you can see from your window at Hillside. We sat and had a drink at The Talbot Inn looking back at Llanerch Farm nestled in the hillside! We also rode (& pushed!) our bikes up the incredibly steep roads above the farm, but the effort was worth it for the views of the setting sun behind the hills/mountains and across the valley and River Dee - the freewheel back home was exhilarating... and much quicker than the journey up! We also spent an enjoyable day cycling 10 miles or so along the Shropshire Union Canal to the nearby town of Llangollen, which itself is interesting & pretty. We recommend the food at The Corn Mill located on the side of the River Dee in Llangollen, where we had a lovely evening meal whilst taking in the views across the river. Thank you for a wonderful stay and we hope to return again soon. Our 2nd trip to Llangollen did not disappoint, the apartment was spotless, fully equipped and inviting with stunning views, just the relaxing weekend we needed !! We would highly recommend this beautiful little place. This is a lovely cottage buried deep in the Welsh countryside and " guarded" by some steep, narrow lanes. An ideal location from which to explore the beauty of the region and to enjoy the spectacular views. A trip on the Llangollen canal is a must and taking the walk over the famous aquaduct is well worth doing. We thoroughly enjoyed our week at LLanerch Farm and are happy to recommend the acommodation. But what makes Hillside so easy to recommend is its ideal location. With nearby access to the A5, those looking for a base from which to explore North Wales will be hard pressed to find a better place to stay. We were able to visit numerous heritage locations during the day and still find time to relax at Hillside in the evenings. Best of all was how helpful the owners were from the second the booking was made. They provided suggestions of places to visit and generally made us feel welcome at Llanerch Farm. As such, we're already thinking about when we can next visit! In short, if you're looking for a picturesque place to explore Wales from or just somewhere to relax with stunning views, Hillside is the place to book. Situated above the Dee Valley with extraordinary views. Stunning weather and the time of year meant sunset was over Castell Dinas Brân and Llantysilio Mountain whilst pheasants and partridges wandered past the back garden and buzzards circled above. The property itself was superbly presented. In essence only 3 rooms: kitchen, living room and en suite bedroom but each one was homely, clean, comfy and with everything you need for a stay. This is a great base to explore North Wales from, just off the A5. Although it's a fun climb from the valley through Froncysyllte to the farm! If we're ever in need of another trip to North Wales this place will be option number one! We are located on quiet lane above the A5 between the 19thC village of Froncysyllte and ancient town of Llangollen. Llangollen (a 10 minute drive away) is bustling with cafes, bars, restaurants and delis selling Welsh produce. Llangollen's world-renowned International Eisteddfod takes place every July, and the town also hosts annual comedy, music, food, walking and Christmas festivals too - to name but a few! In terms of shopping, Llangollen is super-handy for groceries and takeaways, and there is a Tesco Superstore a little over a mile away in Cefn. The border market towns of Oswestry and Wrexham are easily accessible (both just under 20mins by car), or if you fancy shopping 'til you drop, Chester and Shrewsbury are both a mere 30-40mins away by car. We are lucky to enjoy a fantastic choice of local walking routes across mountains, over moorland, along rivers and through woodland. The Panorama, Horseshoe Pass, Valle Crucis Abbey and Pistyll Rhaeadr/Ceiriog Valley walks are particularly popular. We're also situated on the A5 leading straight to the "Gateway to Snowdonia", so a great location to explore further into North Wales too. There's a superb range of adventure activities and experiences in Llangollen (including white water rafting and gorge walking), as well as caving, bungee jumping, canyoning and pony trekking in the area. As well as actually being able to see Castell Dinas Bran (a 13th century castle built on earlier ancient settlements) and the UNESCO World Heritage Site of Pontcysyllte Aqueduct from Llanerch Farm; we are also very close to 13th century Chirk Castle (seat of the Myddletons), Plas Newydd (18thC home of the celebrated Ladies of Llangollen), and Erddig Hall, which offers a unique sense of below stairs life in a Victorian country house. Other great places to explore include Betwys-y-Coed and Snowdonia, Pistyll Rhaeadr (a stunning waterfall and one of the seven Wonders of Wales), the Ceiriog Valley, Ellesmere and environs, and the lovely Welsh coastal villages of Port Meirion and Port Madog. Our local native wildlife is hugely important to us and we are passionate about continuing to work to create a haven for the wild creatures we share our land with here. You can watch some of our beautiful wildlife from Hillside itself - binoculars and bird book provided! We also have a number of lovely nature reserves on our doorstep and black grouse lekking on the moorland across the valley. Our favourite visitors to Llanerch include peregrine falcons, partridges (listen out for their arresting, mechanical calls) and spotted flycatchers. We keep regularly-updated brochures, leaflets and information outlining all of this info in Hillside for our guests to browse through during their stay.